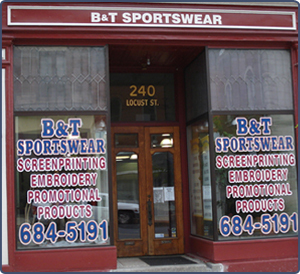 B&T Sportswear is a family-owned business that was founded in July 1980. 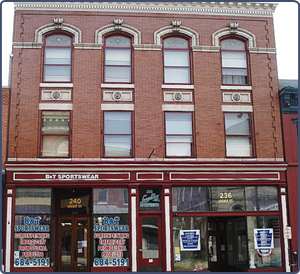 In May 1983 it moved into its present location in the historic Mellinger Building located at 240 Locust Street, Columbia, PA (see building description below). B&T Sportswear provides quality embroidered and screen printed wearables, as well as promotional products to businesses, schools, teams, groups and other organizations. Wearables include T-shirts, sweatshirts, sweatpants, shorts, polar fleece, casual and dress shirts, polo shirts, jackets, hats, caps, blankets and more! Promotional products include tote bags, pens, pencils, magnets, lanyards, calendars, can coolers, carabiners, mugs, water bottles, golf items and 1,000’s of other items. B&T Sportswear is valued by its customers because we are reliable, fast & friendly. Our customers tell us we’re the best! The Mellinger Building is important for both its architectural and historical significance. Parts of the structure may date back to the mid 1800’s, but the façade, the elements of architectural significance, was probably built in c. 1904-05. As a structure, this façade represents a very competent adaptation of the Beaux-Arts style to a commercial building of moderate scale. The scale, ornament, and remarkable integrity of the façade make it an important element in Columbia’s National Register Historic District. The first floor façade has two matching storefronts with display windows and recessed entry areas. These storefronts are enframed by Tuscan Order pilasters and a moulded frieze of cast metal. The walls of the second and third levels of the façade are build of fine quality gilden Roman or Pompeiian bricks laid in common bond with brick quoins at the corners. Terra cotta panels separate the second and third store windows. Segmental arched heads for the third store windows are enframed by light terra cotta architraves with central Grecian keys. The façade is crowned by a galvanized metal cornice with dentils and scrolled modillions. This façade is virtually entirely intact to its original design and appearance. In 1983 the basement, first floor and façade was rehabilitated for B&T Sportswear and a commercial rental space. The second and third floors were converted into four residential apartments.